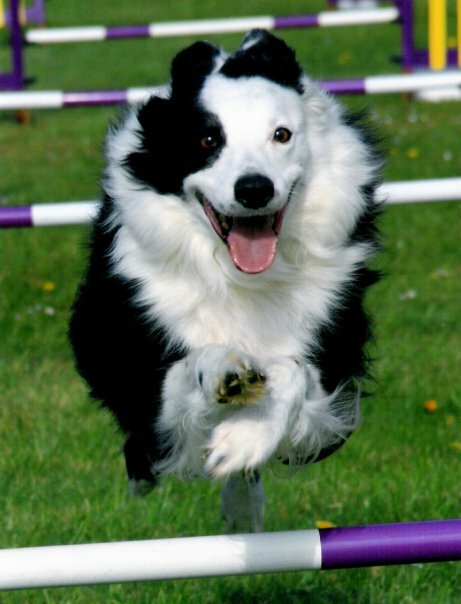 My mum worked at the vets and when a 6 month old half white headed dog (which reminded her so much of her dog, Phiz) came in to be put to sleep because he had mental problems, she quickly assessed that the main problem was the owner and that the dog could be passed to Valgrays Border Collie Rescue to go to an agility home. We fostered him overnight; ready to hand him over to Valgrays at the show the following day. Mum had told me she was going out that evening and that I was to leave the dog alone as she was unsure of his temperament and he was in a strange new environment. But I couldn’t help myself; by the time Mum came home I had taught him , sit and ‘down’ and was in full cuddle mode – I was completely besotted. The next day came and we had to hand the little man over, after all, the previous owner had signed him over to Valgrays Border Collie Rescue and not to the Skinner family. But approximately 8 hours later following a number of tears and a phone call home to Dad we adopted the little man from Valgrays, re-named him Sprite and he came back home with us! Sprite did come with issues; a fear of men and children, not great with other dogs, very snappy and VERY herdy. But these are all things we worked through and learnt to deal with. Later in life he would need his right eye removed and continue to compete in agility, with some new training and a slightly adapted handling system for myself. Sprite was a huge Mummy’s boy, he would do anything for me and has been everything I wanted him to be and more through the most difficult parts of my life. When we had to say goodbye in 2012 he left a big hole in my heart but he meant so much to so many people and I was inundated with messages following our loss. I am privileged to have had him pick me as his Mum all those years ago.